To replace the factory radio with a new aftermarket head unit which is compatible with a lot of practical features is one of the most popular ways for car owners who want to pursue a more comfortable car life. If you know how to install a new head unit, you may find it easier for you to replace a car radio. Please look at the image below, it’s a great 2003-2009 VW Volkswagen Golf Plus head unit from Seicane. If you have the same dashboard with it, you can take the following 2003-2009 VW Volkswagen Golf Plus head unit installation guide as a reference. This multifunctional VW Volkswagen Golf Plus head unit is the best choice to upgrade your factory radio with GPS navigation function, DVD, Bluetooth, WIFI, radio, USB, SD built in. You can go anywhere without getting lost with the guidance of the turn-by-turn direction and voice prompts. To sync your Bluetooth-enabled cell phone with this unit, you are able to dial and receive calls without taking your hands off the steering wheel control to keep safe. The best way to stay away from feeling bored on a long journey is to play your favorite music or videos via the iPod/USB wired connection. 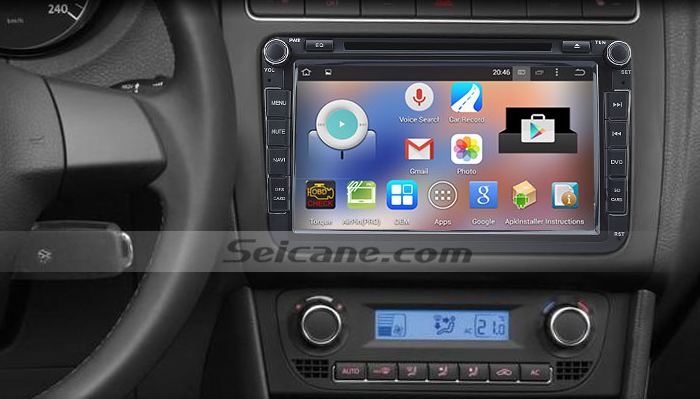 Wish you have a wonderful time with this appealing VW Volkswagen Golf Plus head unit from now on!